Sometimes, you just don’t have a data warehouse from which to get data for your data mart, so you have to source the data from applications yourself. In many (probably most) of these situations, you create a quick-strike data mart — in effect, a miniature data warehouse but built to meet the demands of a set of users who need the data content now. You follow the same methodology and complete the same processes of data extraction, transformation, quality assurance, and loading as you do with a data warehouse. 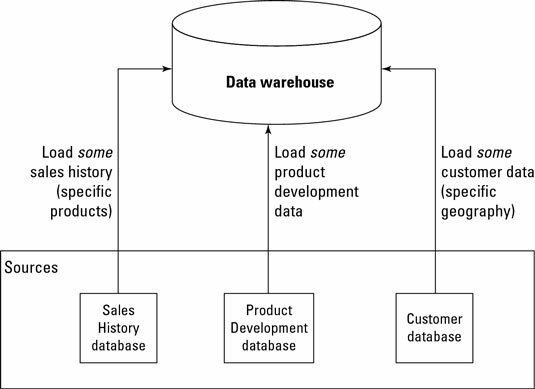 The difference is that you use this methodology on a smaller scale than you do with a full-blown data warehouse. As shown in this figure, you often need to bring data into a top-down, quick-strike data mart to answer a specific set of business questions within relatively narrow confines. For example, you can add data about a specific region or territory within a company, a subset of a company’s overall product line, or some other subsetting model. Speed: A quick-strike data mart is typically completed in 90 to 120 days, rather than the much longer time required for a full-scale data warehouse. Cost: Doing the job faster means that you spend less money; it’s that simple. Complexity and risk: When you work with less data and fewer sources over a shorter period, you’re likely to create a significantly less complex environment — and have fewer associated risks.